Mexico is now seen as the most dangerous country in the world to be a journalist, writes Donnacha DeLong, president of the National Union of Journalists. For the past six years, Mexico has witnessed an extreme escalation in the activities of gangs and drug cartels. In 2010 alone, Amnesty International reports, the government had recorded 15,000 gang-related killings, particularly in the northern states. In Ciudad Juárez alone, nearly 3,000 people were killed, including several mass killings of young people. Many of the killings are by the gangs themselves or people caught up in inter-gang warfare. It is unclear how many people have also been killed in actions by the police and army to take on the gangs and cartels, or – more disturbingly still – by local police and army officials who have themselves become mixed up in the drug gangs. Discerning the responsibility for individual acts of violence is difficult enough in Mexico, but even more so when the diviners of truth – the journalists working in the country – are themselves so often the targets. Mexico is now seen as the most dangerous country in the world to be a journalist. 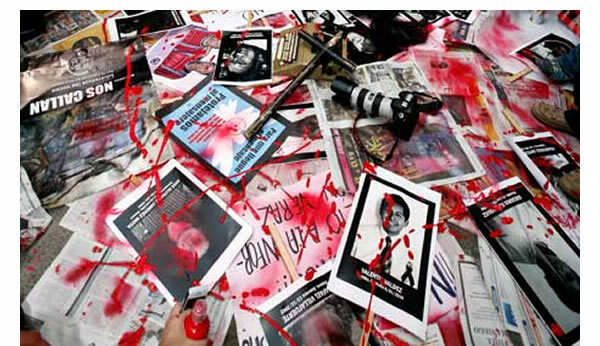 “During 2011 Mexico remained the deadliest country for journalists with 11 killings recorded. The drug trafficking related violence that has laid to waste parts of the country continues to claim lives of thousands of citizens. “In this lawless environment, journalists have become the prime targets. Despite the establishment of the Special Prosecutor’s Office to investigate and prosecute those responsible for crimes against journalists, over 98% of media killings remain unresolved. Impunity in Mexico has a long history, Amnesty International also point out that human rights abuses committed during the country’s “dirty war” of the 1960s remain unpunished; likewise the collective punishment of the indigenous community of the region in the southern state of Chiapas that followed the Zapatista uprising in the 1990s. The murder of Brad Will, an American Indymedia journalist – killed while covering the 2006 Oaxaca uprising – remains unsolved and unpunished. This climate of local police corruption, human rights abuses and legal impunity is the toxic nightmare in which violent drug cartels are thriving, despite the state’s war against them. It is in this context that journalists are putting their lives at risk trying to do their jobs, and as this exhibition shows, far too many are paying the ultimate price simply for telling the truth.